More than a handful of friends and acquaintances asked me if I was really Manny Pacquiao’s cutman during his fight with Lucas Matthysee at Kuala Lumpur a few days ago. “It was all over the web that you were picked by Manny Pacquiao to be his cutman, but we didn’t even see you up the ring,” one said. Well, it was well and good that I didn’t get to go up the ring and work on Pacquiao. That means he had no injury that needed my services as his cutman! What is a cut man anyway. What exactly is your job description?” another asked. The famed internet encyclopedia further stated: “The rules of combat sports stipulate that these injuries can be a cause for premature match stoppage, counting as a loss to the injured fighter”. “The cutman is therefore essential to the fighter, and can be a decisive factor in the outcome of the match”. The cutman’s job is so crucial and can make or break a fight. There is no argument about that! It is also for this reason that they command and deserved the industry standard pay of 5-10% of the prize money. The value of a cutman therefore, as a person and a professional deserve proper attention, and respect. And, if I may add, he does not get an iota of the spotlight unless blood starts flowing from a fighter’s face. Given that, most seasoned and responsible teams as a gesture of appreciation for the importance of the services of the cutman, provide them simple perks like a nice single occupancy hotel room and an upgraded plane ticket particularly if the fight is far from town. Promoters, certain team members and a few close-in aides of the fighter, particularly those involved in huge fights always consider themselves deserving of these perks and automatically provide themselves with such! They even provide it to rings announcers particularly, the celebrity kind. It should not take much therefore, to provide the same perks to the cutman. 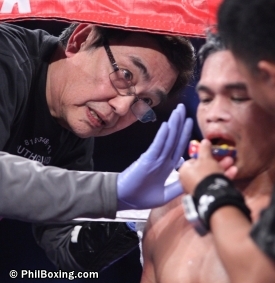 After all, the cutman is just as important to the fighter as the promoters and close in aids. More importantly, a fighter and his team members must never diminish the value of what the cutman can do for the fighter regardless of extenuating circumstances connected to the fight. They should never skimp on cost by picking a lesser-qualified person, much less not hire a cutman at all and allow the trainer to act as both trainer and cutman. And, they should never low ball a cutman and treat him like an ordinary peon. Trainers on the other hand, regardless of their experiences in handling injuries must keep away from doing a double role by acting as a cutman too. They should focus on the fight and analyze it as it evolves so that they can advice the fighter as to what necessary adjustments must be made to swing the fight in their favor. Acting a dual role as a trainer and a cutman diminishes a trainer’s focus and that can lead to the fighter losing the bout due to the trainer’s divided attention. One great example of the value of a cutman happened in the Hollyfield-Moorer fight back in April 1994 and another, at a relatively low-key fight between two lesser-known fighters - Jose Antonio Rivera and Arturo Nina a year after. I chose to highlight these two fights to demonstrate that good cutmen are a necessity in all corners, be it a huge title fight or a lowly bout between two up-and-comers. The Hollyfield-Moorer fight as described by Dave Anderson in his April 1994 famed article “The Cutman Who Wasn’t There” best exemplify the value of a cutman. Apparently cutman Ace Marotta, was “dismissed” by Hollyfield in order to save his $25,000 fee. Unfortunately when Hollyfield was cut in the 5th round of the fight, the new cutman hired was not able to control the bleeding. Hollyfield lost in the closely contested fight. After the fight Hollyfield admitted that the cut “bothered” him as the blood kept on getting to his eyes. The flowing blood from the cut diminished his ability to see the punches coming his way. It was one of the reasons he lost. Would Marotta perhaps made a difference? Who is to know? In hindsight, it would not be wrong to assume that he may have made a heck of a difference! Then there is the Jose Antonio Rivera-Arturo Nina fight in December of 1995. Rivera in the end needed 42 stitches to close his cuts. Reports indicate the severity of the cuts could have easily given the ring doctor a reason to stop the fight. But his cutman New York’s Dave Tenny handled the cuts so magnificently allowing Rivera to continue fighting and eventually win the fight. There must have been more fights that were prolonged by a cutman and allowed the fighter to win but suffice it to say the two fights mentioned above are glaring examples of the value of the cutman.